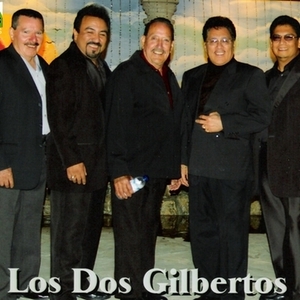 Los Dos Gilbertos come straight at you with their style of conjunto fino music straight out of the Lower Rio Grande Valley along with other artists like Mazz, Roberto Pulido, Jesse Serrata, Ruben Vela. Gilberto Garcia, accordion player is the leader of the band and together with Ruben Garza team up as the voices of the band. Dario Gonzalez is the current drum player and Enrique "Flaco" Naranjo is the current bass player. Both Flaco and Ruben Garza played with Ruben Vela at one time or another. Los Dos Gilbertos play mainly old style conjunto music for the working class folk and still play to such crowds in the local dance halls. They have a huge selection of music and have recorded for several record labels. Hacienda Records holds the largest number and they have recorded with Tica, and several others. If you like old fashioned tejano/conjunto music, then this is your chance to listen to some of the very best of last breed of bands that set the pace. This band along with Ruben Vela are the remaining artists with this style of music and once they are gone, it will fade away into history.